There’s a total eclipse of the Moon on Monday 21 January 2019. Great news, but there’s one slight problem – it occurs in the wee small hours of the morning. Total lunar eclipses are fascinating spectacles to view, but probably many people will give this one a miss, given the timing in January. No likelihood of all-night eclipse parties, as happens in summer! But if you are keen enough, here’s what to look for and how to observe it. And don’t think you’ll catch the next one as there’s bound to be another right behind – this is the last decent total eclipse of the Moon until 2028! 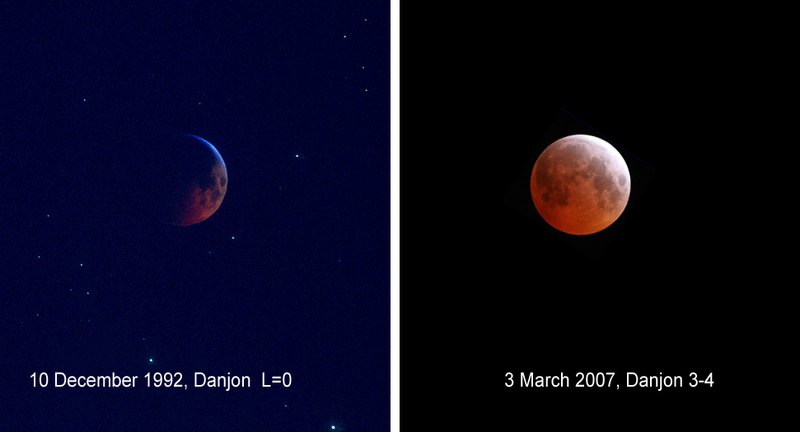 Lunar eclipses occur when the Moon passes through Earth’s shadow. This happens roughly every six months. Although the Sun, Earth and Moon are in line every full Moon, the orbits are tilted somewhat so more often than not the Moon misses Earth’s shadow completely, so there isn’t an eclipse every full Moon. But on Monday morning (remember, you’ll need to stay up on Sunday night) the Moon passes right into the densest part of the shadow, so the Moon will go dark. It starts off by entering the outer shadow, known as the penumbra, so it will appear slightly darker than usual on its left-hand side as the Moon moves from right to left through the shadow. After an hour, it starts to enter the darkest part of the shadow, the umbra. This takes just over an hour, then the Moon is totally eclipsed for a further hour. Finally the whole sequence is reversed, and the Moon starts to move progressively out of the shadow for another couple of hours. The timings also apply across the whole world where the Moon is visible, but in the appropriate time zone. So in New York, for example, the times are all five hours later local time and the eclipse is at its maximum just after midnight, with the Moon very high in the sky. So you can ring a friend in the States and you’ll be viewing it at the same instant if you get your time zones right. Here’s a graphic of the Moon moving through the shadow. It moves from right to left through the shadow, but from left to right through the sky. Notice that because on this occasion it doesn’t go centrally through the shadow, the northern part of the Moon is likely to be lighter than the southern part. You’re only likely to see the stars surrounding the Moon during the total phases – they are actually fairly faint. During the total stages, Moon is completely within the Earth’s shadow, so all the Sun’s light is cut off. But it doesn’t go completely black. There’s always a bit of light refracted around the edge of the Earth, even when the Sun is completely covered by the Earth. If you could stand on the Moon during a total eclipse you’d see the Sun gradually being hidden by the Earth’s larger disc, but even when it’s totally behind the Earth there would be red light bent around by our atmosphere. The Sun’s light would have to travel through a lot of atmosphere to reach the Moon, so its becomes reddened – we see this every sunset, when the Sun’s light passes through the lowest and densest parts of the atmosphere. So being on the Moon would be like seeing all the sunsets around the Earth at once. 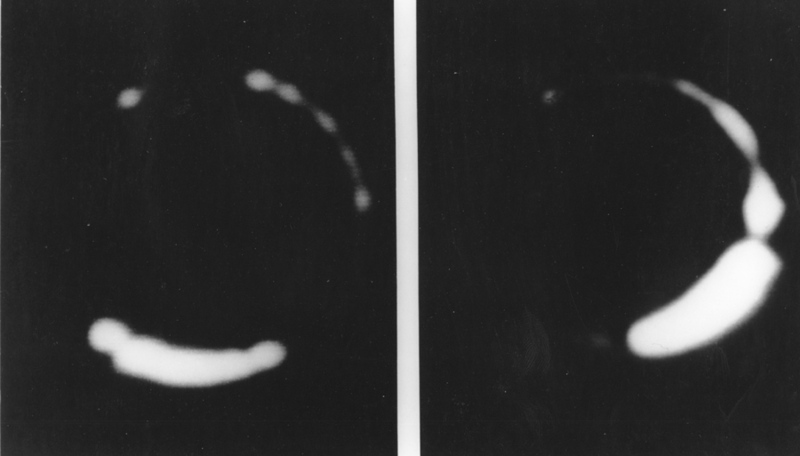 No human has stood on the Moon during a total eclipse, but in 1967 a spacecraft on the Moon, Surveyor 3, did photograph the event with its black and white camera. It showed that some parts of the atmosphere were brighter than others. Where there was a lot of cloud, it was dark. So if all the parts of Earth at the rim as seen by the Moon happened to be cloudy, the eclipse would be dark, and if they were clear, it would be bright. Volcanic ash in the atmosphere along the rim can also have an effect. L = 0: Very dark eclipse, Moon almost invisible, especially in mid-totality. L = 1: Dark eclipse, gray or brownish coloration. Details distinguishable only with difficulty. 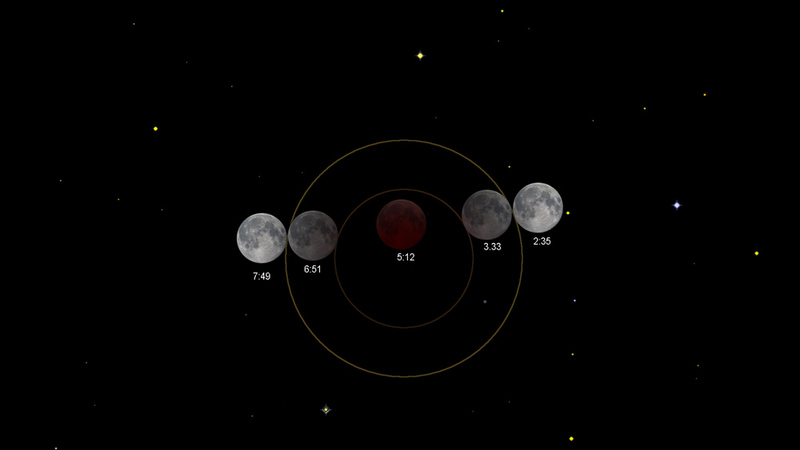 L = 2: Deep red or rust-coloured eclipse, with a very dark central shadow, and outer edge of the shadow relatively bright. L = 4: Very bright copper-red or orange eclipse, with a bluish rim to the shadow. Here are photos of two extremes. In both cases the Moon was positioned in about the same place within the shadow as in this January’s eclipse. In recent years the media have taken to calling an eclipsed Moon a Blood Moon, because of its colour, and this one is also being called a supermoon because it happens to be a bit closer to Earth than average. Astronomers don’t use these terms but if they get people out there looking at the Moon, they’re a good thing. Actually, the Moon isn’t at its closest to Earth until 8 pm on Monday, but at mid eclipse it will 99.9% of the size when it’s closest. The full Moons of each month have been given different names, which all sound very folksy, but most of them were probably invented in the 20th century with very little actual evidence for them being used. So the January full Moon is supposedly the ‘Wolf Moon’. You can enjoy the eclipse with nothing more than the naked eye, but binoculars will give you a better view. If you’re using a telescope, you’ll probably get the most dramatic view using its lowest-power eyepiece. If you want to photograph the event, first read our help page on snapping the Moon. But for the total phases you’ll discover that the exposure times needed are very much longer than for the usual bright Moon. As it’s unknown beforehand how dark the eclipse will be there are no firm guidelines, but typically you’ll need to give exposure times of between 1 and 4 seconds through a telephoto lens or telescope. The longer your focal length, the greater the chance that the Moon will move noticeably through the sky in that time, so you’ll need to increase the ISO setting if possible to get a sharp image. Amateur astronomers will be using telescopes on driven mountings that automatically track the Moon during the exposure, so they get a sharp image. The next total eclipse of the Moon is on 16 May 2022. Only three years away, you say, and in May. But the problem with that one is that the Moon sets just before maximum totality, around 4 am! OK, what about the next one? The same thing happens on 14 March 2025, and then the Moon sets from the UK before totality even starts! Then on 7 September 2025 the Moon rises fully eclipsed, though at a more reasonable time of around 7:30 pm BST. After that there’s one on 31 December 2028, when the Moon rises just before totality in the evening. In June 2029 there’s one where the Moon sets while eclipsed. So make a mental note to be around for 20 December 2029, the date of the next total lunar eclipse which is fully visible from the UK, with mid totality about 10:40 pm. It’ll be cloudy, of course.